Saturday, February 4, 2017, 8 a.m. – 2 p.m. The University of Southern California, is presenting a half-day educational event to encourage the residents of East Los Angeles (Boyle Heights, El Sereno, Lincoln Heights, and neighboring communities in the San Gabriel Valley) to prepare for the opportunities related to STEM disciplines. 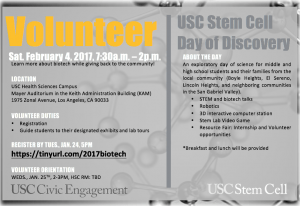 If you are interested in volunteering at the event, please sign up at tinyurl.com/2017biotech. Community volunteerism and a certificate of appreciation will be given (breakfast and lunch is also provided). A volunteer orientation will be held on Wednesday January 25th in the afternoon. Once you register, we will send you the location and exact time. Please help us spread the word, you may download volunteer flyer here. Contact Zul Surani at biotech@usc.edu. 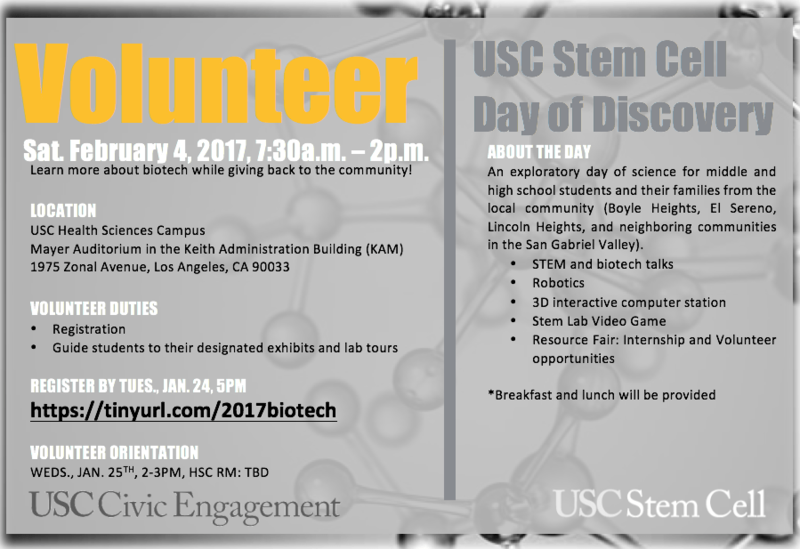 This event is co-sponsored by USC Civic Engagement and USC Stem Cell.